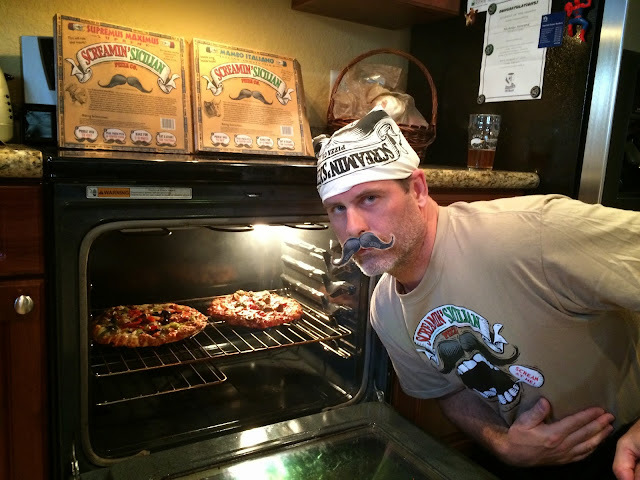 By now you've probably read Part One of this series introducing you to Screamin' Sicilian Pizza Co. Hopefully I've made the case for craft pizza and you've had the chance to pair one of their eight varieties with a beer or two. Bessie's Revenge was a great pizza to start with, extremely cheesy. Today I wanted to check out the other two options that are available locally for me: Supremus Maximus and Mambo Italiano. You may have guessed by those names that there will not be any lack of toppings! And you'd be right. Mounds of rich toppings are going to need an equally bold beer. I picked a few I thought could work pretty well. For Bessie's Revenge, I picked craft beers with wide distribution. I did the same today though I also decided to promote the idea of drinking locally brewed craft beers as well. Using local ingredients supports your community and helps create the freshest products possible. 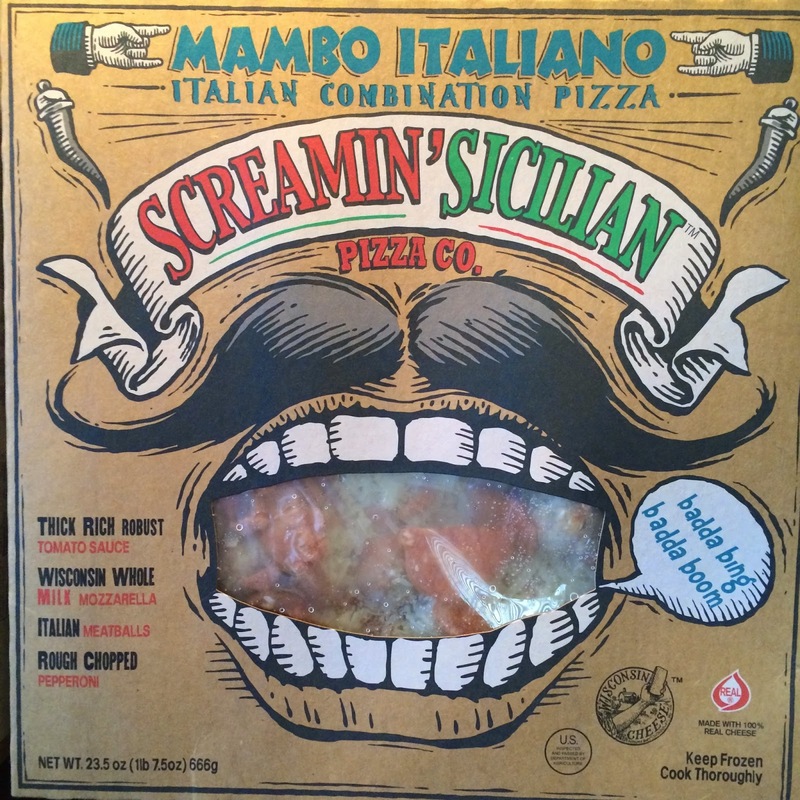 You can tell Screamin' Sicilian is all about that strategy with their ingredients: "Wisconsin [this], Wisconsin [that]" is all over their packaging! I picked four beers to match up with Supremus Maximus and Mambo Italiano, and we drank them interchangeably with the two pizzas. Founders All-Day IPA has a bright, sharp hoppy flavor able to stand up to the big meaty toppings. Similarly, Victory Brewing's Prima Pils was an excellent choice for its hoppy prowess. I also found that two bigger bodied, more balanced IPAs paired nicely. Dogfish Head's 60 Minute IPA is a long time favorite while Funky Buddha's Hop Gun is a newer local favorite recently bottled for the first time. Each pizza box in the Screamin' Sicilian line has a "window" shaped like a mouth where you can see all the ingredients. Each mouth is also screaming something at you. 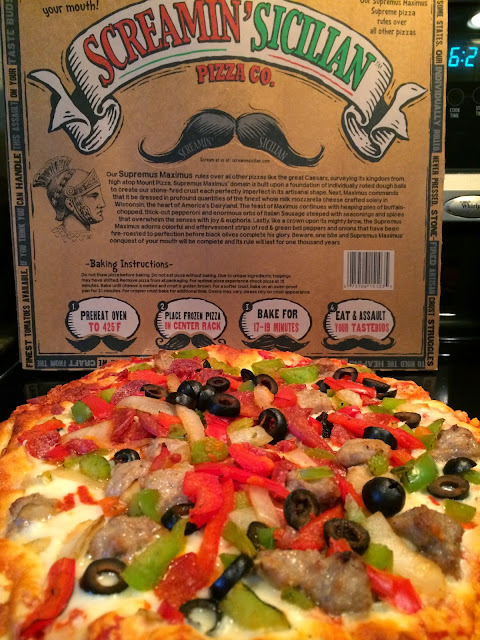 Supremus Maximus is daring you to try with "This will rule your mouth!" while Mambo Italiano just went with "badda bing badda boom." Put your cursor over the other names here for some other fun rants! 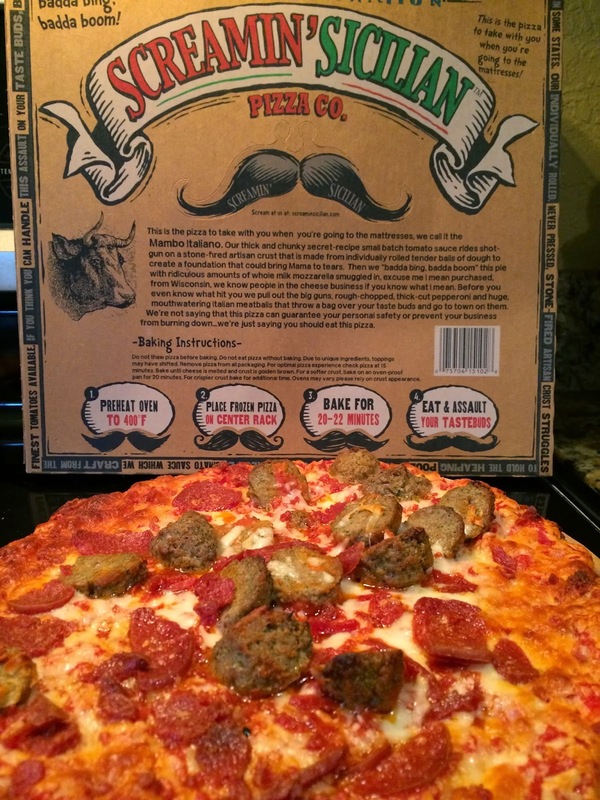 The back of each box has equally creative stories about the pizza names. 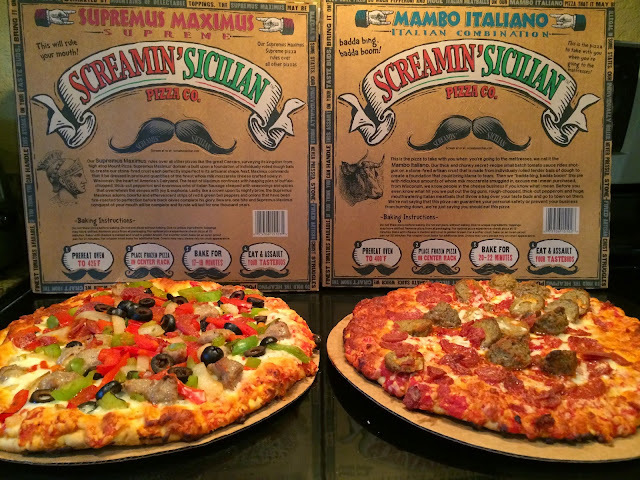 Supremus Maximus rules over the others from high atop Mount Pizza while Mambo Italiano is the pizza you take when you're going to the mattresses! Seriously, can't make this stuff up! Both pizzas were excellent. The crunchy crusts should not be overlooked despite the obvious attention to the toppings on these two. I loved the sausage and the crunchy roasted peppers and onions on Supremus Maximus. And pepperoni and meatball lovers will have a field day with Mambo Italiano. Quality and quantity! So who's ready to check out the Screamin' Sicilian pizzas? I have a few $3 Off Coupons that I can send out (first come, first serve--leave a comment and a way to reach you). If you're shy, you can still get a $1 coupon at Screamin' Sicilian's website. 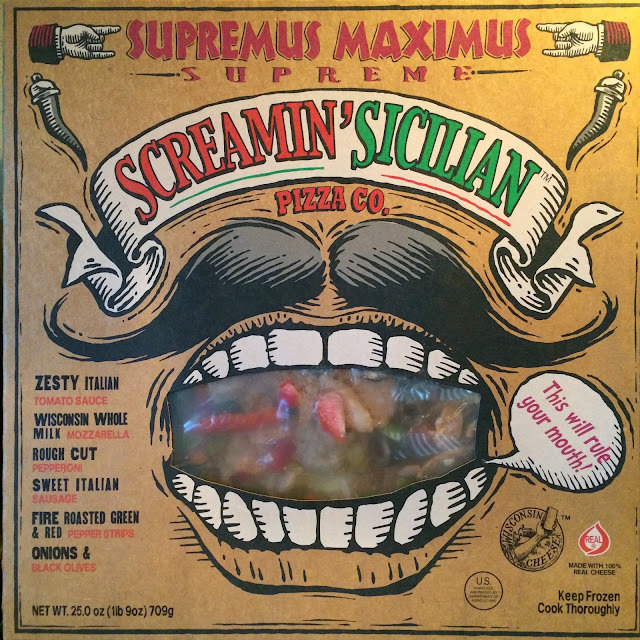 And be sure to tell Screamin' Sicilian what you think of their products!